Cars and parts for sale. The beauty or the beast for you? Page with links to other sites. Pictures of the meetings of the Lancia Classic Team. Capolavoro by Bill Jamieson, a "must have" book about the Lancia Lambda. Lancia Flavia pages. Brian Long and others bore you to death. Newly produced parts for your Lancia. A growing list. New - The forum has been upgraded!!! 1. I logged in to new forum before. Go to forum.viva-lancia.com. Log in. Preferences set? 2. I am a new visitor to the forum. Go to forum.viva-lancia.com. Register. Set preferences. 3. I was registered on the old forum. Go to the password reset page.. Type the email address you used in the old forum. Click Send. An email with a reset link will be sent to the email address you entered. Click the link. Enter your desired password twice. Note 1: The email address has to be the address which was used in the old forum. Note 2: The reset link is NOT your new password. You have to click the link and enter your desired password twice. If you forgot your email address, go to 4. 4. I forgot the email address used on the old forum. Click here to see your known email address. If you no longer use that email address, you can change it. Follow instructions. 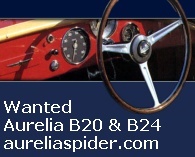 Enjoy the Lancia Aurelia site of Geoff Goldberg. Standard versions have dynamic advance curves pre-programmed and switch selectable. TUNE versions have an USB port which allows you to program your own curves. State of art replacements for Dunlop brake pots for Fulvia, Flavia, Flaminia. Parts books, exploded views, service & workshop manuals, specifications, brochures, ads. Jan '03: The racy appeal of the little Lancia´s! Aug '02: Lancia. Innovation, sophistication, simplicity. May '02: Vincenzo Lancia sets record in 1904 Florio Cup. The Lancia emperors of the road and off-road. Most of us know about Lancia's kings and queens of the road. Check these Lancia emperors of the road and off-road. www.viva-lancia.com was started by Huib Geurink in July 1996.
www.viva-lancia.com is an independant site. www.viva-lancia.com hosts the official pages of the International Association of Lancia Clubs. Although the magazine of the Lancia Motor Club (UK) is called "Viva Lancia! ", this website has not part of the Lancia Motor Club (UK). Contributers who have prepared pages are mentioned on those pages. Pages of Tassos Kollias. Greek god brings Fulvia back to life. Growing a Gamma Coupé. Keith Lam harvests a Gamma Coupé. Pages of Huib Geurink, webmaster of viva-lancia.com. Including pictures of the Tulpenrallye. Lettera aperta agli Italiani ed al Governo Italiano. Open letter to the Italian People and the Italian Government. If you want to put a link to this site on your site, please, use the picture below.